If you're testing ports using the tool provided below, or any other serial port testing tool and can't seem to get any data sent or received, contact your hardware technician. Execu/Tech does not employ hardware technicians and will not be able to assist you. It is the customer's responsibility to ensure that all hardware is properly functioning before contacting Execu/Tech. Contacting a hardware technician who understands serial ports will save you time and money. This page is provided as a courtesy to those unfamiliar with the different aspects of serial communication. The steps provided on this page should only be performed by someone who feels confident in their abilities and is willing to assume responsibility for any mistakes and damage to hardware that may occur. Troubleshooting serial hardware and identification of port numbers is the responsibility of you or your hardware technician and not Execu/Tech Systems The hospitality industry employs serial interfaces quite heavily for devices like phone systems, energy management systems, pole displays, printers, scales , etc. If you're unfamiliar with serial communication, we provide some basic troubleshooting steps and a tool that will assist you in troubleshooting your serial hardware. When you've finished troubleshooting, you should be able to provide us with basic information like Call Accounting is on COM1, PBX is on COM2, etc. Finally, be prepared to do a Google search for any terms or procedures that are unfamiliar to you. 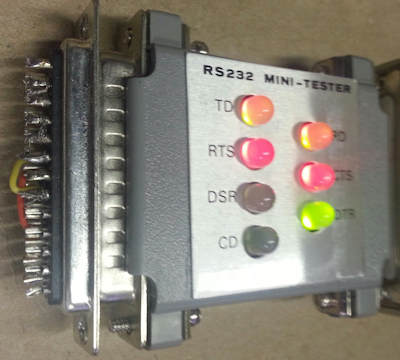 Many technicians familiar with the needs of the hospitality industry will have a tool similar to this, commonly called an RS323 Tester. The second image shows what the tester looks like with the port open and data transmitting and receiving. the TD and RD lights appear orange because they're flashing between green and red too fast for the camera. With this tool, you can troubleshoot nearly all serial connection issues. You can quickly and easily determine which serial port you're dealing with, whether or not it's been opened by the interface, and whether or not data is flowing. You can also determine the same information about the 3rd party device. You can buy the simple testers, like this one, for less than $20. You will also want to invest in a couple of DB9 to DB25 adapters, both male and female, so you'll be able to test whatever size port you encounter. Each tester is a little different so read the manual that comes with yours. 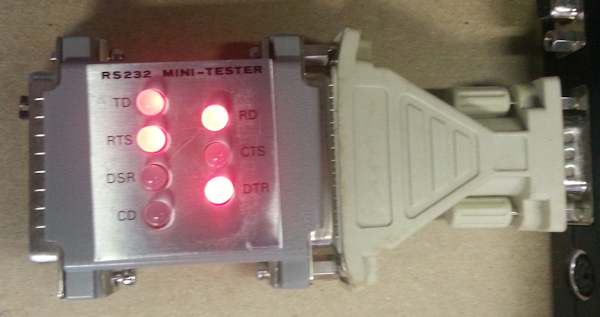 With this tester, the lights tell you that while there is power to the serial port, the port has not been opened. Once the port has been opened, the DTR light will turn green. As data passes through the tester, the TD and RD lights will flash green. You should expect similar light activity if you have a similar tester. When you've tried 'everything' and you still can't seem to get our interface to receive data, it's time to verify which serial port is connected to which interface, and that those serial ports are actually working. To do this, you create a 'loopback' device for the serial port on computer. This device simply connects pins 2 and 3 in the serial port, causing data to flow right back to itself. This allows us to pick a port, send data and see if it returns, letting us know of we have the correct port and if it's functioning. There should be no expectation that your serial ports are properly labeled. This is normal and that's why you need to identify the ports before our interfaces can be configured. When you're finished with these steps, please label the ports to save time and frustration in the future. You can, however, make an educated guess as to which serial ports have been assigned which com port numbers. Looking at the computer's Device Manager, in Windows, will tell you which com port is assigned to which serial port. Often, the device's own driver, configuration software or documentation will tell you how to identify the port number, typically left to right starting with the lowest port number. If you have 2 serial ports on the motherboard and COM2 is currently successfully communicating with your phone system and receiving call accounting data, you can logically assume that the other port is COM1, or whichever identity it has been assigned in the Device Manager. These simple steps can be applied to any PCI serial card or USB serial ports like Rocketport or Edgeport and will help you to more quickly identify which com port number has been assigned to which serial port on the back of the computer. Our interfaces match the settings of your hardware so correct knowledge of your hardware is critical in properly configuring an interface. Don't force anything. The pins in serial cables and ports are small and are easily broken if you force them at an incorrect angle. Before you begin unplugging cables, be sure to label all cables and ports with a letter so you'll know where to return them. 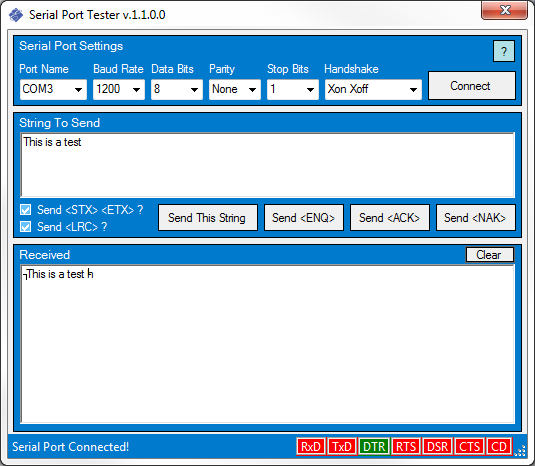 Download our Serial Port Tester application by clicking this link. Extract it to the computer with the serial ports in question. Make a 'loopback' plug. The jumper from a hard drive works well for this simple test and most hardware techs have plenty of them. You can also make a proper 'loopback' plug from a female DB9 or DB25 kit. Use the following table for a guide, though it isn't needed for these troubleshooting steps. Stop all Execu/Tech Serial interfaces before running this test. Unplug the serial cables from the ports being tested. Attach your 'loopback' plug. The simple 'loopback' plug attaches to pins 2 and 3. This image shows a hard drive jumper placed on a DB25 (25 pin) male connector. The male DB25 and DB9 (9 pin) connectors use the same numbering of the pins, starting at the top left, with the longest row on top. If in doubt, put on your glasses and look really closely and you may see numbers near each pin. Female connectors have a mirror of the numbering, with pin one being at the top right, with the longest row on top. The first image shows the simple hard drive jumper and the second shows a proper 'loopback' plug made from a discarded serial cable and some wire. The proper 'loopback' adapter took about 15 minutes to make. It isn't pretty but it's free, it works and you won't have to search for a store that sells one. If you don't have time to make the proper 'loopback' plug, you can canabalize a cable and connect pins 2 and 3 together. Run the Serial Port Tester application. This application is provided AS IS with NO WARRANTY. We don't provide support outside of this document. You may copy it, use it and redistribute it as long as the application remains free. After entering the Serial Port Settings you click the Connect button. If it connects, the status bar at the bottom will read "Serial Port Connected!". If the port didn't open you will see a popup window with an error. Google this error and have your hardware technician help you with a solution. When testing a serial port with a 'loopback' device, stick with easy settings. Use: Baud Rate = 1200, Data Bits = 8, Parity = None and Stop Bits = 1, Handshake = None*. Xon Xoff is also referred to as 'software' handshaking. RTS is also referred to as 'hardware' handshaking. RTS / Xon Xoff combines both 'hardware' and 'software' handshaking. Most devices require at least Xon Xoff handshaking and won't respond with None so start with Xon Xoff handshaking when testing 3rd party devices if you can't find the manual telling you which setting to use. RTS handshaking won't work unless the devices support it and the cable is properly wired. You have several options for sending serial data. These checkboxes affect how the serial data is sent when the Send buttons are clicked. Send ? Check this box to add a , or Longitudinal Redundancy Check to the end of the data. This is a simple Xor of all of the bytes in the data, excluding the . Don't use this setting if your 3rd party devices uses a different formula. These buttons will send serial data. Send This String This button will send the string in the box labeled "String To Send." A or Line Feed (Hex 0A) is added to the end of the data before it's sent. This is often require for serial interfaces as a method of letting the other side know you're finished. After the port is connected, type something in the String To Send box, then click Send This String. If you're connected to the correct port, and your 'loopback' plug is in place, you will see that same string of text in the Received box. When testing using a 'loopback' device, the receive (RxD) and transmit (TxD) indicators will be green because the string is being both transmitted and received through the same port. When testing 3rd party devices, you will typically only see the transmit or receive indicator active and not both at the same time. This is the nature of serial communication. Unless the interface provides responses, you may never see both lights active for a particular interface. In this image, you see characters at the beginning and ending of the string "This is a test". This is because both checkboxes were checked and what you're seeing is the ASCII representation of the , and characters. This is normal and shouldn't be confused with garbage, as discussed in the next step. Most serial interfaces send plain, readable text. If you see nothing but garbage, like in the picture below, the most likely reason is an incorrect Baud Rate. Change this setting, click the Connect button and have the 3rd party device send the message again. After you've verified the identity of the serial port, you should label it. It's common for a hospitality server to have several serial ports with no real identification. This lack of identification may be part of the reason you need troubleshooting assistance. If you don't see anything but you're sure the 'loopback' plug is properly installed, try another com port and click Connect, again. Next, click the Send This String button. Do this until you see the message in the Received box. If you can't get anything to show, you need to hire a qualified hardware technician to take a look at your serial ports. After verifying the serial port, you can use this application to test whether or not you are receiving data from the 3rd party device. Attach the serial cable from the 3rd party device to the serial port that you've just verified. Set the Serial Port Settings in this application to match those of the 3rd party device on serial port you've just verified and connect. Have the 3rd party device send data. Most serial interfaces sent plain, readable text. If you see nothing but garbage, like in the picture below, the most likely reason is an incorrect Baud Rate. Change this setting, click the Connect button and have the 3rd party device send the message again. If you see the data you were expecting, you've got all the settings right and you're ready to modify the interface settings and restart them. If you still don't see data, you'll need to work with your hardware technician and 3rd party device vendor to resolve the communication issues. Execu/Tech can't help you until you can verify that data is being received from the 3rd party device.